Marcus Samuel Blitzstein, born on March 2nd, 1905, was a composer from Philadelphia who revolutionized American musical theater in the 1930's. He studied with Arnold Schoenberg in Berlin and with Nadia Boulanger in Paris, and was very open about his belief that “true art was only for the intellectual elite.” If it was accessible to the general public, he thought it was not art and he publicly denounced composers like Kurt Weill and Ravel for “debasing their standards.” He composed a variety of modernist pieces with this elitist attitude in mind, from piano sonatas and concertos to operas and incidental music for films, but his 1937 musical The Cradle Will Rock ironically launched him into the national spotlight because of its social and political relevance and accessibility. Blitzstein wrote The Cradle Will Rock shortly after the death of his wife, novelist Eva Goldbeck. The two of them were very close, and her passing devastated the composer. She was fully aware of his homosexuality, but their marriage had been more of a companionship than a romantic relationship and in losing Eva he lost his best friend and intellectual partner. By all accounts he was shattered by her death, and as a result devoted himself entirely to composing his next work, a sensationally political operetta unlike any of his previous compositions. It brought him a great deal of attention, both good and bad. "Steel Workers" by Russel T. Limbach. Smithsonian American Art Museum collections. The musical takes place in “Steeltown, USA,” and follows union organizer Larry Foreman’s efforts to unite the workers of the town under a union banner and to fight back against the all-powerful Mr. Mister, who is in control of every part of town life. Part of the reason the musical was so successful was how recognizable Blitzstein’s characters were. From the working man fallen on hard times to the evangelical preacher to the greedy, powerful tyrant, all of the lives portrayed in Cradle were immediately relevant to the audience. And thanks to labor strikes happening all over the country, the musical’s plot was just as real. This relatability made Blitzstein’s pro-union message even more potent, and that’s when the trouble started. Orson Welles portrait, taken by Harry Warnecke. National Portrait Gallery collections. Under the direction of twenty-one-year-old Orson Welles, Cradle was set to begin its preview performances on Broadway at the Maxine Elliot Theatre on June 16th, 1937, under the sponsorship of the Federal Theater Project, a branch of the Depression-era Works Progress Administration. Welles had just finished his famed all-African American production of Macbeth in Harlem, and was eager to start a new project. Cradle, with its edgy political relevance and catchy pop-style music, seemed like the perfect fit. However, the Federal Theater Project was already taking heavy criticism for the nature of some of the more radical productions it had been sponsoring, and under the guise of budget cuts they shut down the production four days before it was scheduled to open. The theater was locked up and placed under guard. On opening day, Welles, Blitzstein, and producer John Houseman were calling all over the city looking for another theater in which they could perform. Disaster after disaster struck. First the actors’ union informed them that the actors could not appear on any stage not sanctioned by the Federal Theater Project. Next, the musicians’ union informed them that with the move to another theater they would have to pay the musicians their full rate instead of the reduced FTP rate, as well as back pay for previous rehearsals, and they would also have to hire more musicians to comply with standard Broadway contracts. On top of this, the theatrical company had no access to their costumes, props, and set pieces, since the theater was under lock and key. It seemed like there was no way Cradle would open that night. Thankfully, Welles had an idea: once they found a theater to rent for the evening, the actors would come to the venue and perform from the audience. Blitzstein could accompany them on piano, since he was not a member of the musicians’ union, and sing the parts of whichever characters were missing. While they frantically hunted for another theater, the audience began to gather outside the Maxine Elliot. Some of the cast ventured outside and performed for the crowd to keep them happy, and a few short minutes before the premiere had originally been scheduled, someone managed to rent the Venice Theater for $100. The crowd willingly followed the cast and crew twenty-one blocks to the new venue, and The Cradle Will Rock opened just before 9:00 pm. 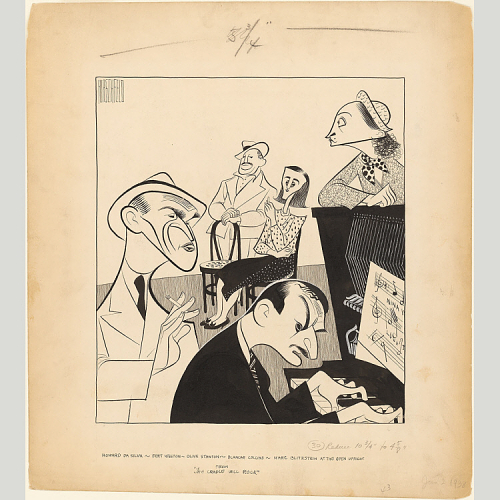 "Cradle Will Rock Team" by Al Hirschfeld. National Portrait Gallery collections. Blitzstein was alone on the stage, and as he sat down at the piano and began the first song, he heard a small voice begin to sing along from the house; it was Olive Stanton, the actress playing the role of the prostitute Moll. Following her example, as the show proceeded, various other cast members stood up and performed their roles while scattered among the audience, never setting foot onstage. The crowd loved it, and the show was a hit. Despite having no props, costumes, or sets, the resoundingly pro-union message of the musical was abundantly clear, and it resonated with the audience. Cradle ran for nineteen more performances at the Venice, and under new financial backing continued to run elsewhere long after the initial production finished, often with the same sparse staging that the premiere had featured. Patti LuPone performs "Moll's Song." Video hosted by YouTube. Blitzstein continued to write after Cradle’s groundbreaking performances, composing musicals, symphonies, tone poems, and beginning work on several operas that were completed posthumously by composer and friend Leonard Lehrman. He also joined the Air Force during World War II, serving as music director of the American broadcasting station in London. After his return, he was called before the House Committee on Un-American Activities under suspicion of being a Communist. He admitted to having been a former member of the party, and in typical Blitzstein fashion boldly challenged their right to question him, eventually refusing to cooperate. He was released and not called back. Blitzstein died in 1963 as a result of a beating at the hands of three sailors he met at a bar. America mourned his passing, and composer Leonard Bernstein dedicated a performance of Beethoven’s Eroica to him with great sorrow. As a result of the Cradle debacle, Orson Welles resigned from the Federal Theater Project, Houseman was summarily fired from the WPA, and together they continued on to found the Mercury Theatre, famous today for its radio series, including Welles’ sensational The War of the Worlds broadcast. They produced several different versions of Cradle, including a radio broadcast version, and the show continued to be popular across America once the commercial rights were released in 1938. It has since been revived many times, and in 1999 Tim Robbins directed a film that presents a dramatized version of the events leading up to Cradle’s premiere. The political message of Cradle is just as relevant now as it was then, and its continued revival speaks to its potential to reflect on contemporary society. The conflicts between freedom and security, corruption and innocence, and power and integrity may have changed their manifestations, but they still exist today and the continuing impact of The Cradle Will Rock can be found in its ability to speak plainly to these issues through music. Lauren Vanderlinden is an intern in the Division of Culture and the Arts at the National Museum of American History. She will be a senior at Lawrence University in Appleton, Wisconsin, and will graduate with a Bachelors Degree in Anthropology and Music.